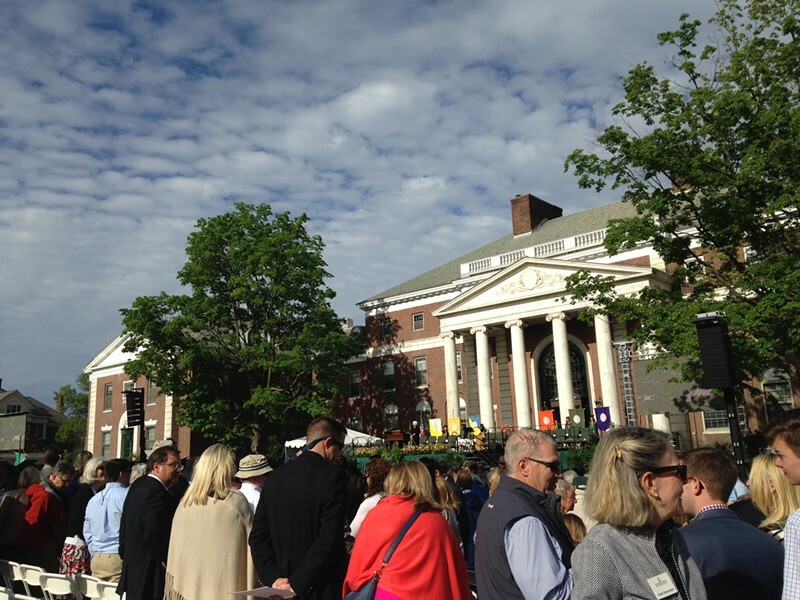 James Fallows gives the commencement address at UVM Sunday morning. Always vote, consider a run for office and subscribe to a newspaper even if there's a way to finagle a free read. 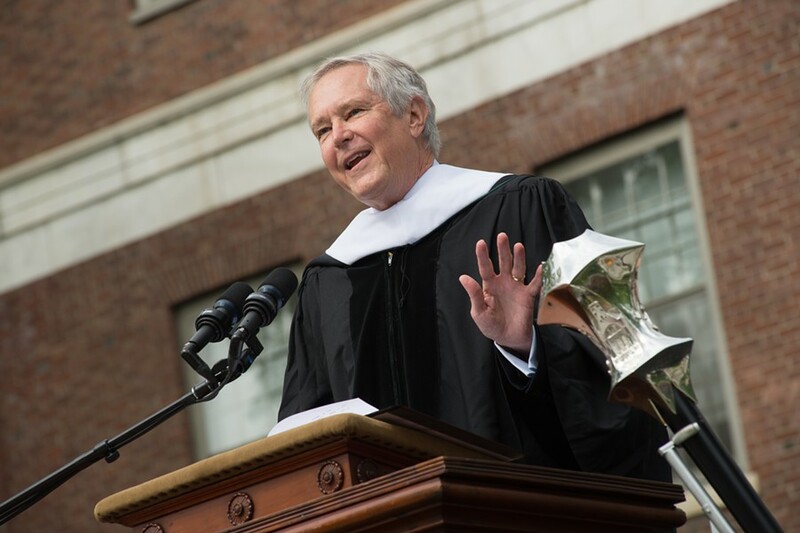 Those were among the pieces of wisdom that author and Atlantic Monthly national correspondent James Fallows doled out to thousands of students and their families during his commencement address at the University of Vermont Sunday morning. Oh, and one more thing. 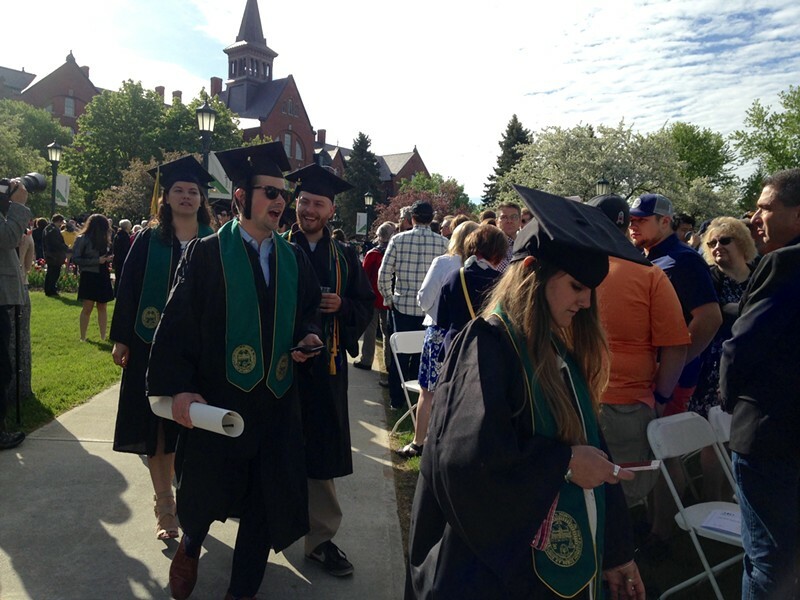 "Get in the habit of being happy," Fallows told the UVM class of 2017. The outdoor ceremony on the UVM green unfolded with pomp and a touch of playfulness. Students wearing gowns and mortar boards bounced a brightly colored plastic beachball into the air, volleyball style, as they sat facing a stage full of academics wearing robes and sashes. The UVM marshal and president of the faculty senate, Catherine A. Paris, led the processional carrying the UVM mace, a cast-bronze staff given by the class of 1927. The weather was chilly enough that some guests wore down and fleece layers over their sundresses and sandals. Politics was a theme in numerous speeches, including the one Fallows gave after he accepted an honorary degree for his achievements as a writer. He did not mention President Donald Trump by name, but he said the times of "our 45th" president represent a difficult era of "fake news" and "imperiled" science. Good science matters more than ever, Fallows said, generating cheers from the crowd, to which he responded: "Yay science. We're all proud to be Catamounts when science gets a cheer." Families gather at the University of Vermont green Sunday morning for graduation. Fallows and his wife, Deb, have lived around the world and will soon move to London, where he will help lead a new Atlantic Monthly office. Fallows said his travels taught him that what is noblest about the U.S. is its "openness to talent from around the world." He made a reference to Trump's promise to erect a barricade between the U.S. and Mexico when he said, "My America is not the one that builds a wall." But there is good in the present era as well as bad, and this polarity goes back to early civilization, Fallows said. Charles Dickens understood it, with his famous "best of times, worst of times" introduction to A Tale of Two Cities, Fallows said. So did historian Michael Kammen, who was about to win the Pulitzer Prize for a book called People of Paradox when Fallows graduated from college in 1970, Fallows told the crowd. The book describes the unprecedented opportunity in America, but also the evils of slavery and the removal of native peoples. Fallows spoke of the good-bad duality in another of his favorite reads, an essay about American self-governance, "The Moral Equivalent of War" written by William James in 1910. It examines how the disaster of the Civil War brought forth America's greatest president and many acts of selfless behavior, Fallows said. Students proceed to their seats. He urged the graduates to recognize the good and bad in their own times and be a force for the former by always voting — even for minor elections such as school board — and getting involved in politics. "Somebody is going to hold these difficult offices. Let it be you," Fallows said. Other speakers included Gov. Phil Scott, who told the students to plunge ahead even if they aren't certain they are making the right move. "That's OK; don't overthink it," Scott said. The governor, a 1980 UVM grad, said he thought he was going to be a technical education teacher but that after a student-teaching stint he changed his mind. The job just wasn't right for him, he said, and he started a business instead. He made his way to the state legislature and then to the governor's office. But Scott described himself as still just a "race car driving, construction working boy from Barre." Get in the swing of things, he told the young people, and don't be too hesitant. The governor quoted hockey great Wayne Gretzky and said: "You miss 100 percent of the shots you don't take."